During the two years I worked on The Hamsa, I became very interested in Celtic spirituality. I obtained a Celtic Prayer book authored by William John Fitzgerald. I still use it daily. 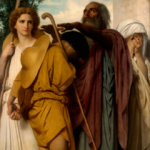 One scripture reading from the Book of Tobit captured my attention. I had never read the Book of Tobit. Frankly, I had not even heard of the Book of Tobit. Fortunately, I live not far from the Redemptorist Renewal Center in Picture Rocks at the edge of the Saguaro National Park in the Sonoran Desert of Arizona. The Center has a wonderful library and I spent many early mornings reading the Book of Tobit. You will note that on the title page of The Hamsa, I include the aforementioned quotation. While The Book of Tobit is perceived in different ways by different people of different religious persuasions, I believe The Book of Tobit tells us about doing the right thing under any and all circumstances, and that is the core concept of my novel Tobit and the Hoodoo Man. Trained as a warrior, I respect all men and women who serve and who have served their countries in uniform though today, I am an avid supporter of non-violence. In deference to popular American culture, I believe ‘the greatest generation’ of American servicemen and women were those who fought and died in the Civil War, the War Between the States. Their efforts preserved the United States of America. If Americans love their country, they must acknowledge that it remains intact due in no small part to the more than 600,000 men and women who died to preserve the nation some 150 years ago. 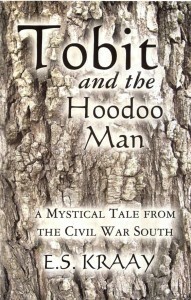 After reading the Book of Tobit several times, I decided I would write a manuscript and tell the story of Tobit with the Civil War South as its backdrop. 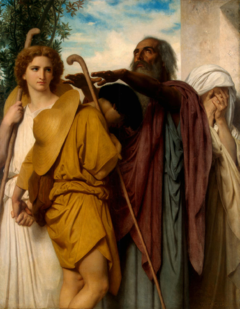 I tried diligently to include all of the major events in the biblical Book of Tobit. That objective led to many twists and turns that made writing this manuscript an enjoyable process. Unfortunately, from my perspective, I had already used ‘Raphael’ in The Hamsa, so I elected to use another archangel, Gabriel in his stead as I wrote Tobit and the Hoodoo Man. Hoping to stay true to form and in context with the Apocrypha, I introduced another ‘mystical’ dog and named him Caesar after my own best friend. Story ideas come from many sources. I have a lengthy list of concepts and ideas that continually grows, ideas I intend to develop into manuscripts. I encourage you to develop and keep you own ‘list’ so that you never run out of ideas worthy of your talent. As much as I love Winston Groom’s novel Forest Gump and the subsequent film of the same title, it was not on my mind as ideas flooded my brain on how to tell this story of dignity. The more preliminary research I did, the more frequently I came across historical names of note. As I craged the story, it was very reasonable for me to think that my protagonist, Bronisław Czech [Bronek] could have crossed paths with a large number of notable personalities. The pre-war Olympics were not populated by thousands of athletes, but by only hundreds. at the last Winter Olympics in Vancouver in 2010, for example, over 2,500 athletes competed compared to the 231 athletes who participated at the Lake Placid Olympics in 1932. It was easy for me to envision that my handsome hero may have been a romantic interest of Sonja Henie, or that he might have had a personal conversation with Franklin Roosevelt. Research breeds ideas, reasonable and logical ideas that can enhance and energize the core values of any manuscript. While some stories naturally require more research than others, the very act of research can uncover new ideas worth pursuing on a current manuscript or a subsequent manuscript. Do your research. Roots grow deep. I was raised a Catholic. My father’s best friend, Louie Green was a Jew, and I remember attending the Seder Supper at Louie’s home during Passover when I was a young boy. 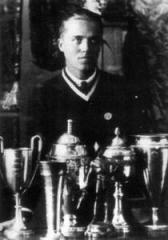 Because of Louie Green and several boyhood friends including Bobby Sandler and Marty Shindler, things Jewish were not foreign to me, rather, I was greatly interested in them, primarily from a biblical perspective. 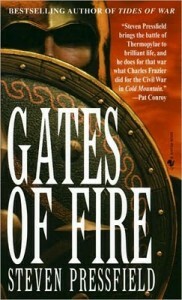 I began reading Leon Uris novels [Exodus, Mila 18, etc.] as a teenager, and one rainy afternoon, I discovered Dr. Viktor Frankl’s volume Man’s Search for Meaning. Dr. Frankl’s book inspired a life-long interest in Jewish things that evolved into an intense awareness of the Holocaust. In 1976, I penned — and I mean literally wrote with a pen on paper — my first novel manuscript and titled it The Messiah. It was set in a concentration camp. The handwritten manuscript remains unpublished and in a closet. Thirty years later in the mid-oo’s, I came upon a picture titled “The Last Jew in Vinnitsa.” I will never forget that photograph. Stories exploded from the image louder than the impending blast from the soldier’s gun. I had recently completed The Olympian: A Tale of Ancient Hellas, and I was preparing to write my second novel, this one about human dignity. 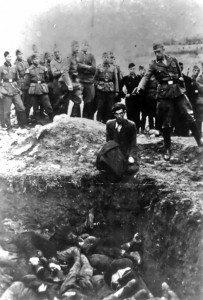 I believe the depth of human dignity was tested no more strenuously than it was for the Jews in WWII. were in Auschwitz at the same time. The more I read about Bronislaw Czech, the more convinced I was that I found the protagonist for my next manuscript. My working title was Into the Heart of Darkness, and I would use Czech’s story to tell a tale of human dignity. 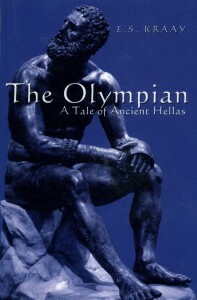 The story behind The Olympian: A Tale of Ancient Hellas has been floating around my head since I was a kid and saw Rudolph Mate’s 1962 film “The 300 Spartans.” Thirty-six years later, a friend tossed Steven Pressfield’s book Gates of Fire on my desk and said, I think you would enjoy this.” My friend was correct. A few years later, I was getting serious about writing a book. I wanted to write about the real worth of a human being … what gives a person’s life value. The Spartan stand at Thermopylae was how I envisioned telling the story. Then I read an article about an ancient Olympic boxer, Theagenes of Thasos who won the boxing competition at the 75th Olympiad in 480 B.C. By pulling the two events together — the Olympic Games and the Battle of Thermopylae — I developed the story I wanted to tell to present my core concept: the worth of a man is determined not by what he does for himself, rather by what he does for others. In 2002, my son Brad and I had dinner with Steven Pressfield at a small Italian restaurant in Malibu. I ran the idea by him. He liked it and encouraged me to go for it. Six years later, the book was in print and the film rights optioned. This page will offer a series of posts that describe my way of taking an idea from start to finish, from a thought to a book. I am not a Steven Pressfield, a Mark Helprin, a Charles Frazier, a Leif Enger or Ron McLarty. One can only wish! … Still, I receive emails and other inquiries about how I go about my writing business. It occurs to me that for every person who asks a question, there are many, many more who have similar questions but won’t ask for one reason or another. This page is for those who want to ask but don’t. If you glean anything of value from these posts and comments, then I’m glad I shared these thoughts with you. I can’t remember ‘not reading,’ though my passion for books was inspired by my 8th grade English teacher, Norman Najimy. Mr. Najimy taught me to love the written word. I’ve always wanted to write ‘books of substance,’ but I never had the courage to follow that passion until the turn of the millennium. I wrote my first, full manuscript – by hand – in 1976 as I sat in ‘the crow’s nest’ at Loring AFB in Presque Isle, Maine pulling alert duty in my F-106 Delta Dart. The name of the manuscript was The Messiah. I’ve done nothing with it and I know I’ve seen it sitting in its cardboard box somewhere in this house. Some three years later in 1979, I wrote my second full manuscript – this one on a typewriter with carbon paper. I’ll not reveal its name just yet because I have it ready to submit, but I’m not certain yet that I will do it. Finally, in 2002, I committed myself to becoming and author. I was 53-years old. Three years earlier, I had befriended best-selling author Steven Pressfield. At a small Italian restaurant in Malibu in the early summer of 2002, I ran an idea by him. His advice: go for it. The result was my first published novel, The Olympian: A Tale of Ancient Hellas.